Sustainable development has become a central objective in national and international policy of development and the environment. Increasingly it also marks international and national law. 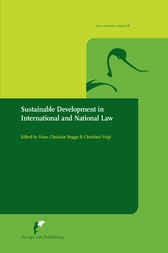 In this book scholars in environmental law treat legal theories on sustainable development and how it may be operationalized, and topics related to its development in international law, European law, international trade and investment law, and within the climate regime.The book marks the 20th anniversary of the 1987 report of the Brundtland Commission which brought the concept of sustainable development to the forefront of the international agenda.